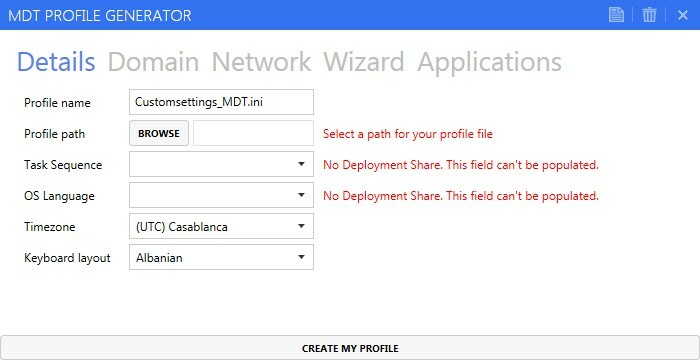 In this post, I'll show you a tool that I have created to generate a profile for MDT. 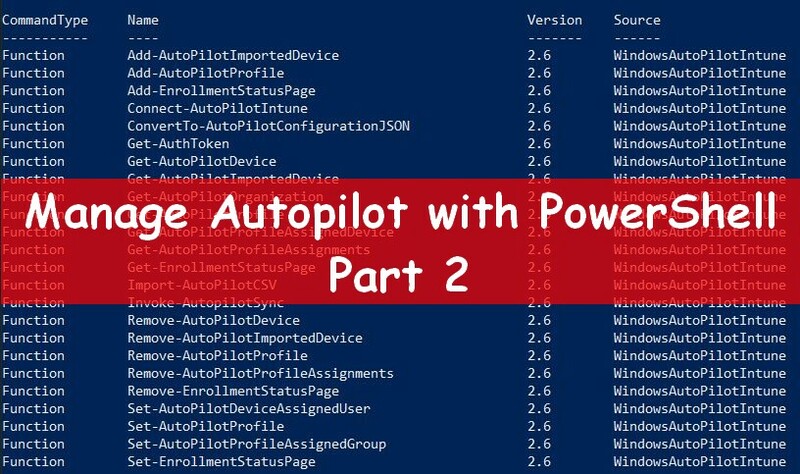 If you usually read my posts you may notice that I like automation and find different ways to do some tasks. 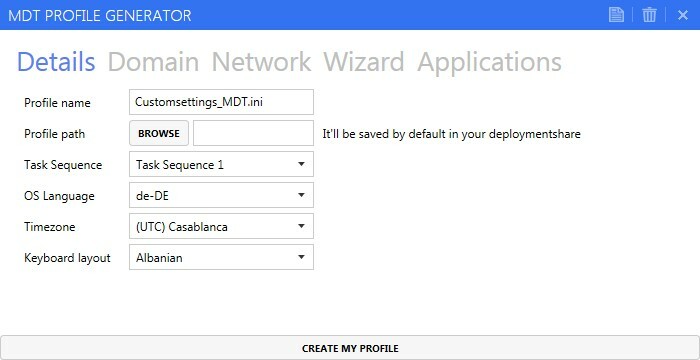 That's why I imagine a new way to use MDT to automate a deployment. So why not using this ini file as a profile ? 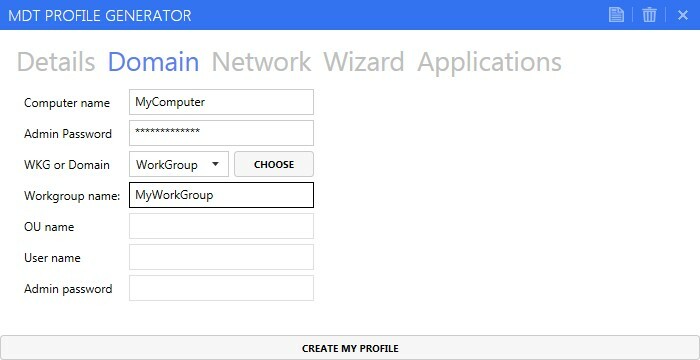 You can create differents profiles, for an example for multiple branch of your company. 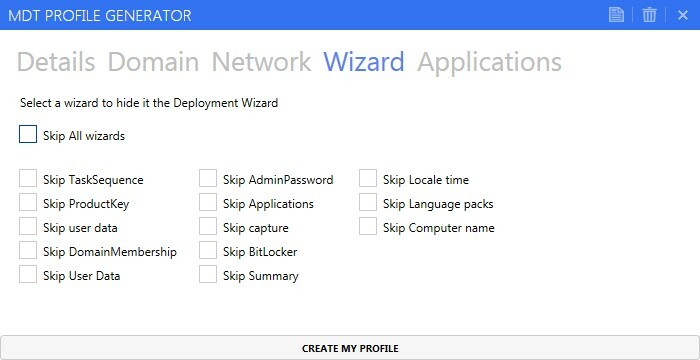 Then select which profile you want to apply during the deployment. 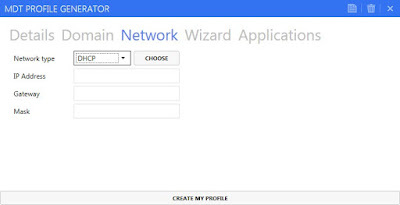 We can imagine a Listbox wizard which will propose you each profile you want to apply. This tool will allow you to create easily this file. 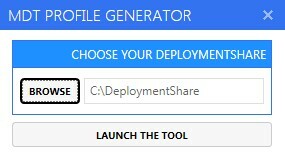 The first GUI will allow you to select your Deployment Share. By selecting a Deployment Share, it'll populate differents fields in the next GUI. 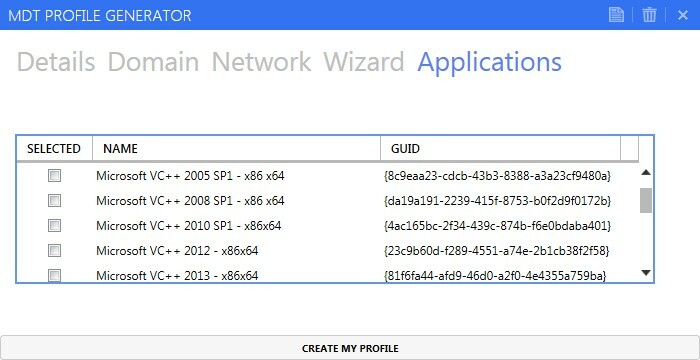 If you run the tool without selecting a Deploment Share these fields won't be populated. Fill fields you want to pre-fill in the Deployment Wizards and then click on the Create my profile button. The ini file will be automatically created. By default it'll be created in the control folder from your Deployment Share. 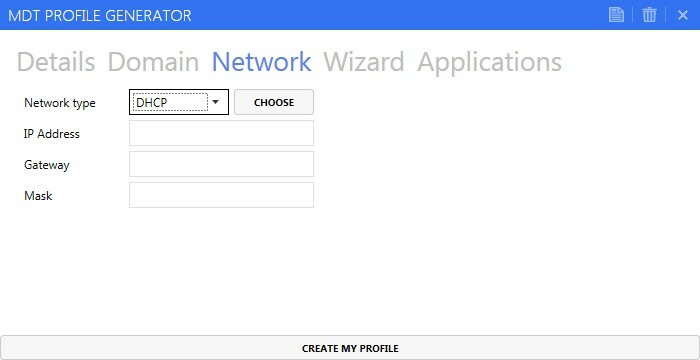 However you can choose another path using the profile path selection. How works the tool ? The Task Sequence listbox lists task sequences found in the TaskSequence.xml file from your Deployment Share. It'll set the TaskSequenceID parameer in the ini file. 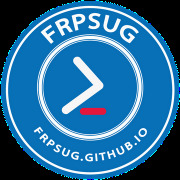 The OS Language listbox lists MUI found in the Packages.xml file from your Deployment Share. It'll add the selected MUI as LanguagePacks1 in the ini file. The Timezone listbox lists content of the MDT_LanguageUI.xml integrated in the tool. I'll set the TimeZoneName parameter in the ini file. The Keyboard Layout listbox lists content of the MDT_LanguageUI.xml integrated in the tool. I'll set the KeyboardLocale parameter in the ini file. 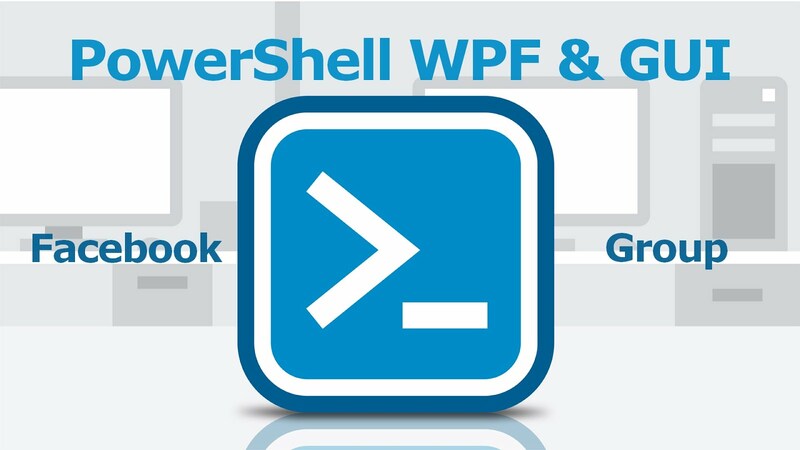 By default the WKG or domain choice is set to Workgroup. To set it in domain choose domain and click on Choose. 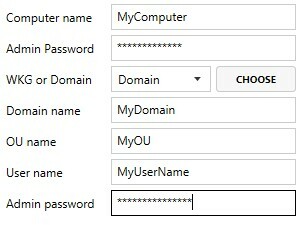 Then fill fields Domain name, OU name, User name and Admin password. 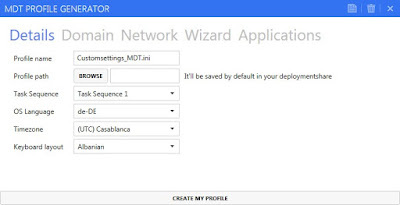 By default the network type is set to DHCP. In this part you can choose which wizard pane you want to skip. It won't be displayed during the deployment selection. 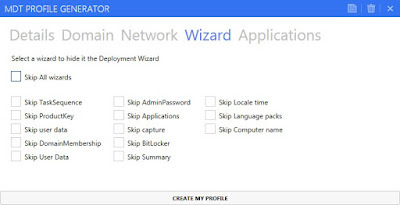 You can find here a great post, from Andrew Barnes aka Scriptimus Prime, about skipping deployment wizard. The applications tab will list all applications found in the Applications.xml from your Deployment Share. 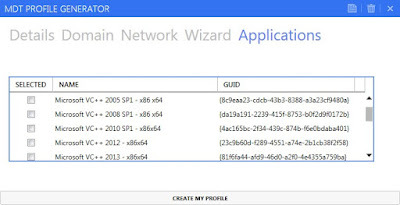 Select an application to set it as mandatory application in the ini file. 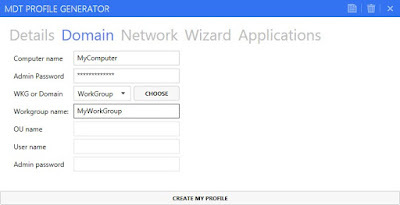 You can select one or multiple application. How does my profile look like ?